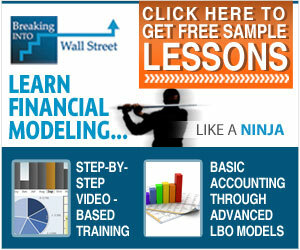 Individuals employed in the finance industry who are interested in taking an investment banking course or a financial modeling class may find that their company is willing to make the training available on-site. Companies have found that on-site training for employees provides a good return on the investment by saving on travel expenses and taking advantage of volume pricing, while also improving the productivity of the company workforce. On-site training also ensures that all employees are receiving the same message, facilitating the sharing of new skills and information, and may aid in retention by demonstrating to employees a willingness to help them develop their careers. Employees working in financial firms who are interested in taking investment banking classes should consult with their employers to determine if employer-provided training is available. Many of the companies who provide classroom training and online training also offer instructor-led on-site courses, for fees customized to the client firm. For employees, on-site investment banking training can be a much better arrangement than obtaining classroom-based training or online training on an individual basis. In the case of corporate training, the company pays the training fees, and will sometimes also pay for tests for accompanying certifications. Corporate training also tends to be customized to the needs of the company, increasing the likelihood that what is learned will be used and retained. On-site employer-provided training is generally held in the office to minimize travel expenses and other delays, resulting in a much more convenient training experience for the employee. Employer-provided training also tends to be scheduled during the business day, eliminating the need for employees to fit training into their schedules after hours. Some companies may ask employees to sign a contract in which the employee agrees to payback the cost of training if they leave the firm by a certain date. Investment firms do this to protect their training investment and is usually a fair trade off for having the cost of the education covered.